China urged the United States on Wednesday to abide by an earlier trade resolution so it can maintain its international standing. 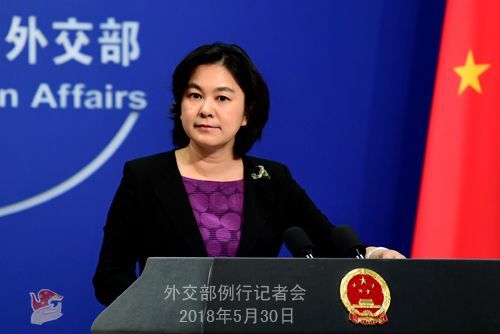 "When it comes to international relations, every time a country does an about-face and contradicts itself, it's another blow to, and a squandering of, its reputation," Foreign Ministry spokeswoman Hua Chunying said at a news briefing. She called on the US to work with China to resolve the simmering trade issues, adding China will take resolute and powerful steps to safeguard its legitimate rights if the US insists on acting recklessly. "We urge the US to keep its promise and meet China halfway, in the spirit of the joint statement," Hua said. The ministry's comments came after US President Donald Trump's administration announced on Tuesday it will impose a 25 percent tariff on $50 billion of goods imported from China that use industrially significant technology. The announcement came just ahead of US Secretary of Commerce Wilbur Ross' visit to China from Saturday to Monday. The statement goes against the consensus the two countries reached in Washington about two weeks ago. Also on Wednesday, the Ministry of Commerce confirmed that a US trade delegation arrived in Beijing for negotiations. Over the next few days, the US delegation of more than 50 people will talk with China's team about implementing the consensus reached in the joint statement, the ministry said on its website. US-China Business Council President John Frisbie said: "We would like to see both sides put the threat of sanctions on hold and quickly get into negotiations to resolve these important issues. Tariffs and restrictions on commerce will have a real and negative impact on the economy and jobs. "We need solutions that will put the trade relationship on a sounder path for mutual prosperity, not sanctions that will do more harm than good. We encourage both sides to use the coming weeks to achieve that goal," he said. In light of the renewed tariff threat from the US, analysts expect a tough job ahead for the third round high-level economic and trade meeting starting on Saturday in Beijing. The US intends to put more pressure on China with this move to gain more economic interests before the talks start in Beijing, said Zhou Qiangwu, director of the international economics and finance institute at the Ministry of Finance. "The US-China trade friction could evolve into far-reaching disputes," Goldman Sachs analysts said in a report. "Furthermore, such trade tensions may not fade away easily, given the urgency possibly being felt by US policymakers who had expected more political convergence from China." 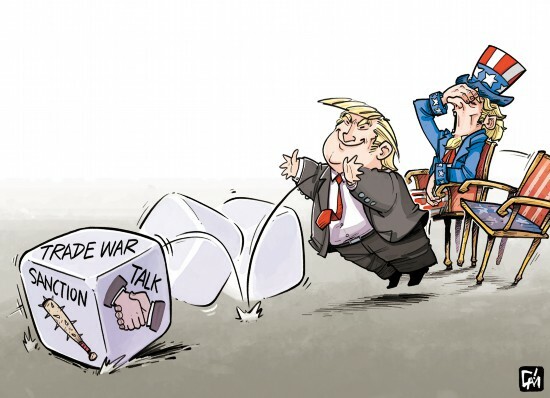 The US threats came just over a week after trade tensions between the two countries had seemingly eased. Treasury Secretary Steven Mnuchin said on May 20 that the trade dispute was "on hold". His comment followed a commitment by China to significantly increase its purchases of US farm goods and energy products. Mei Xinyu, a researcher at the International Trade and Economic Cooperation Institute of the Ministry of Commerce, said China should prepare for the worst, as US trade policies toward China have been so capricious. The country must carefully observe the US government's behavior no matter what kind of bilateral consensuses or deals have been reached. It is unfair to impose sanctions on China, as the country's exports that are subject to potential US tariffs have low added value, said Teng Jianqun, director of the Department for American Studies at the China Institute of International Studies, after checking the latest list renewed by the US.